The Real Estate Regulation and Development Act, 2016 which was enacted by the Indian Legislature primarily for the aggrieved homebuyers is taking all together another shape when it comes to state implementation. The states while enacting and implementing the law are suppose to make states rules in furtherance of the central Act. It is truly said that with power comes responsibility but it seems that the state of Karnataka is trying to misuse the same. The state of Karnataka is a newbie when it comes to RERA and has become fully functional form months itself. The State of Karnataka implemented the rules in July, 2017. It has been more than a year since the rules were implemented but there still seems to be resentment in the minds of the homebuyers. 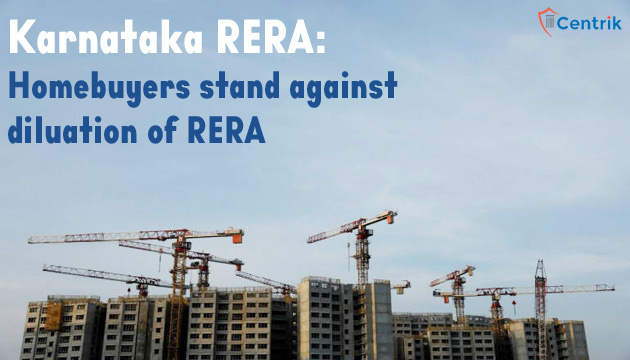 A large number of aggrieved homebuyers took out a large procession against the dilution of RERA by the state government of Karnataka. The homebuyers in a procession in Bengaluru while putting across their grievances raised many points as to how the rules and authority has been diluted in order to benefit the rich and powerful developers. According to them Section-3 of the central Act has been completely diluted and all mandates that were put into place as to project registration has been molded in order to benefit the project developers. They further stated that how buyers in almost all projects have paid more than 70%-100% but the construction has not even reached 50% thereby affecting the interest of homebuyers at a very large scale. Also, many projects have been developed on encroached lands and no action has been done by the authorities. The Homebuyers who had a ray of hope when RERA was implemented are now fighting different demons. It seems that the road to justice for the buyer is a long one.